A popular choice for meeting rooms and conference centers. 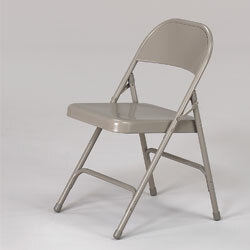 15-1/4"W x 16"D x 16-1/2"H seat is supported by a 19-ga., round tube frame with double-riveted U-shape braces. Contoured back has curled safety edges. Non-mar polyethylene leg glides. 18-3/4"W x 20-3/4"D x 29-1/2"H overall. Sold in lots of 4 only. SPECIFY COLOR: BE - Beige, BK - Black, BL - Blue, GY - Gray. FACTORY QUICK SHIPFOB NEW JERSEY.